A spider looks like the number eight. A head and a chest fused together, its name is the cephalothoraxes. And an abdomen makes another one circle. So, the spider looks like the number eight. How many legs does the spider have? Yes, the spider has eight legs. Wow, the spider has eight eyes. A question about distinction betweeen male and female. Answer one; The legs of males are bigger than females'. Answer two; The eyes of males are bigger than females'. 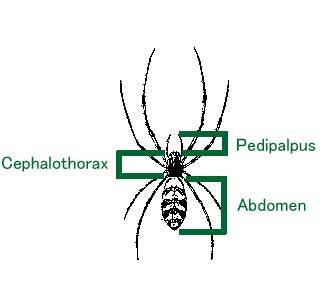 Answer three; The pedipalpus of males are bigger than females'. The right answer is answer three. The pedipalpus of males looks like a boxing glove. and then pushes it into the abdomen of female for mating.